The Moz Toolbar (or MozBar) is a simple way to view onpage SEO elements & link data for any page on the web. It is available as a free download for Firefox and Chrome users. Although you’ll have to pay a subscription to be a Pro user and see all the metrics, the free version provides valuable SEO intelligence as well as easy access to other free tools provided by Moz. The MozBar automatically displays the Page Authority (PA), Domain Authority (DA) and MozRank (mR), of every page you visit. This information is useful to know for your own sites, but also for market research on competitors and websites you want to emulate. These metrics can also be displayed as a SERP overlay, so you can see the metrics for every website displayed on a search results page. As a Pro user you also get to see MozTrust (mT), Domain MozRank (DmR), and Domain MozTrust (DmT). These metrics have been developed by Moz to assess the authority of a site, similar to Google’s toolbar page rank. They are indications of authority based on criteria considered important by Moz. Within the MozBar you can visually highlight the different types of links on each page you view: followed and nofollowed, internal and external and also highlight the keywords on the page. This is helpful for your own site as you can easily see whether all the links on your page are what you expect them to be. Other snippets of information the MozBar provides for free are the IP address of a website, under page elements and attributes, general information about the page, such as the headings, the meta keywords and description and the number of characters in each. The MozBar is also an easy access platform to the other tools that Moz provide such as Open Site Explorer (OSE), keyword tools and Rank Tracker. Unlimited access is restricted to those wanting to pay the monthly charge so those using the toolbar for free often have limits on the number of times they can use each tool per day. You also won’t be able to access some information; such as link data from social sites in OSE and much of the most valuable SEO analysis that can be run on your backlink profile is only accessible with a subscription. During periods of high traffic Pro users get priority so you may find you are unable to even use your free daily credit. 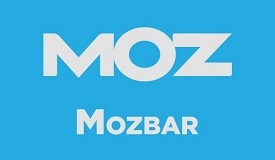 The MozBar is a handy free SEO tool that offers SEO intelligence about the websites you’re interested in. The limited access of the free version means you know what you are missing out on, which can be frustrating, however if you’re finding it that useful you could always upgrade to Pro Membership.